Curtain call time here at the Clubhouse, our season has wrapped up, time to reflect on a good last trip and a decent season here at Langara. The winds are beginning to howl, warning us in another week or so things are go change here on the north coast. 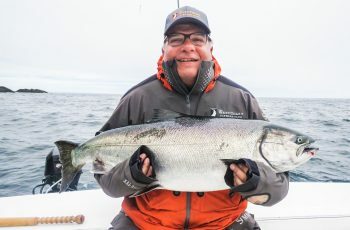 Our last guests left Sunday, all grinning widely, the fish were biting, plenty of chinook, some decent coho, some chum, yes the fall fishery was underway. The fish can now take a deep breath and relax a little more, we are the last lodge boats to finish up, no more hooks in cut plugs to contend with. 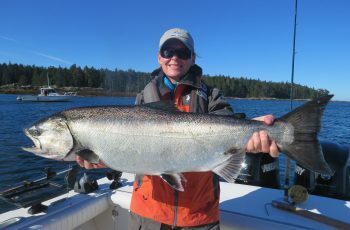 We found one tyee on the last trip, but lots of high teeners, low twenties. Bright fish too, these fish will be out and about for a bit before spawning. Yesterday afternoon, my boat grabbed seven fish, a decent afternoon, but we were not alone. 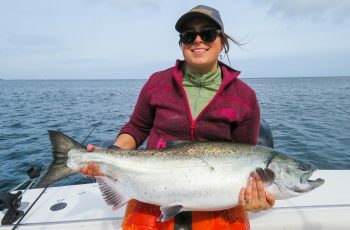 The guides that fished salmon all had good numbers, and more coho have shown up after being somewhat scarce for a week. 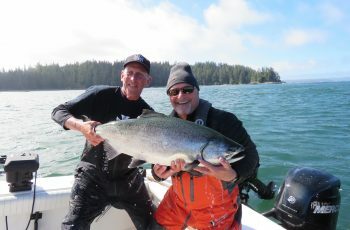 Most of the younger guides started dragging flashers and hootchies, leaving Pat, Todd, Bud, and Hans as the only purists getting our hands dirty in the brine bucket. It was interesting to watch, some tides the flashers hammered the tar out of them, fishing 90 feet, other times we did well with the bait. The way I figured it, we have all winter to troll the meat tackle down south, I just could not give in. Saw some big buckets of fish though, Pred. 1 did well on his big flashers, as did Boat 11, and Bryce could not leave the hootchies out on the deck. Jordie converted, I lost Scott, it was like a disease down on the dock, but the boys produced a ton of fish. Something about a single run on a king, reverse the boat down on the fish, in the net bag in three min. was something slightly disturbing to what I am used to, but the guests appeared to love it, so to each his own. So the guides are for the most part heading south today, young Ryan so excited to get to the south terminal where his roommate Shaun is rumored to be waiting for him. Todd is rumored to be taking a bus to the ferry terminal, now that stinks. Korey can barely walk, his back is out so therapy time for him. Halibut fishing in a westerly, did him in. Pat is dressed in wool from head to toe, with thigh high gum boots, so he is definitely triggered for the south terminal tarmac, hoping it is not 25c like last lime. Budd has a grin on his face, no idea what he is thinking or how he is getting home, a very nice cab ride up to Whistler I suspect. 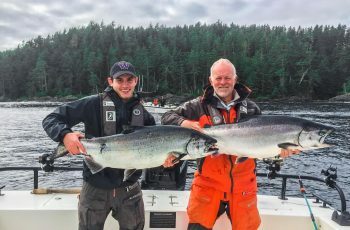 And of course Conman, Matt is already off hunting moose on the 14th, jigging rock cod over the winter, herring gillnetting late Feb in Georgia Strait, as well as some seining in Rupert in March, plus his winter spring fishery, his coho derby at Renfrew. Yup, he cant get enough, his mother told me he would work for free, will remember that next season! Some of the guides are staying on a couple days to run boats into Masset, including Jordie, Miracle Child, Scott…who just announced he wants to be a fireman, and Done, so a couple three trips, 35 miles in to Masset, we will have our fleet dockside and ready for winter storage. Jordie just announced he has a winter job in Campbell River, well done big guy. Seems most of the guys are interested in another season of guiding, so you should see some of your favourites in 2013. Would also like to say a big thank you to some of our suppliers, Islander Reels sure make our fishing fun, thanks to Heather and the gang supplying this amazing reel or us. 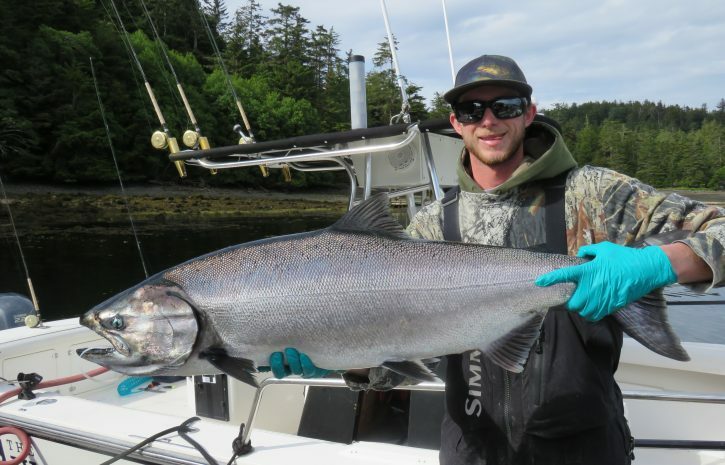 Another key to our fishing here is the Scotty Downrigger, so a big thanks for enabling us to fish deep and fish light, nothing like a large chinook on the line without a ridiculous sliding weight of some half pound tarnishing your fight, not to mention the lead hanging from fish that break off. Also a big thanks to the guys at Bridgeview Marine, Richard Pick and the guys for our Yamaha outboards, those 9.9 trolling engines are sweet, so quiet, and this year so dependable. Of course we believe these large Boston Whalers are a dream to guide out of, so happy that decision was made, we fish where others cant! What a great fleet. Also a big thanks to the guys and girls in the office, the sales team was on fire this year, Brian, Jen, and Lois had the clubhouse booked and a fantastic lengthy season kept the guides busy from May well into September. Remember we post blogs all winter long, plenty of Panama info to follow as well when those winter rains hit the west coast, a pretty big adventure to be had down south there. I think that is possibly why Budd is grinning, he is still having flashbacks from our stay over a year ago. Never did figure out how he lost his passport! Your email address will not be published. Your comment will be displayed when it is approved by the site admin.